I’m a little Overwatch nerd. I like the league, even as an EU viewer. It got me back into eSports after a very long while (I used to watch SC:BW and CS1.6). The times are impossible for EU people to watch (1 am-7am, reruns early in the day, when normal people work), but I do watch the VODs here and there. That’s it. No selections. Static stream. Is this a joke? Two relatively small views, useless face cams, and a stat panel that doesn’t need to be there all the time. Maybe as a dropout to click, like an extension. 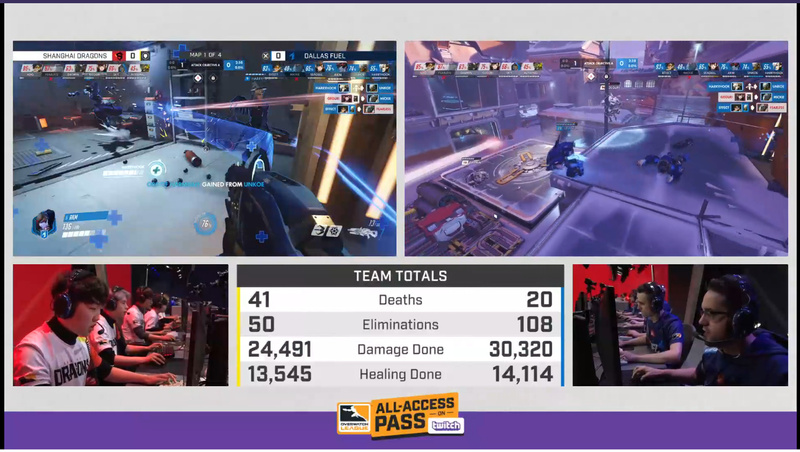 It feels like about 60% of the screen are trash, especially the #AD for the All Access Pass itself, that a viewer would probably have bought already, at least after the free trial. They call this static alternate stream “command center”. You have zero command options. I’ve seen this on other eSports streams, most likely from Korea. There is extra content, like AMA interviews and behind the scenes stuff. You get 3 mediocre skins ingame and a bunch of twitch emotes, some of which look cool. But they are asking 30 bucks for this. 20 if you got prime, only until 11th of april, though. I am deeply disappointed by this, particularly as an EU viewer, since this “command center” is not even available during reruns or on the VODs. I wonder whether Blizzard or Twitch is responsible for this. But as it is, I think it’s disgraceful.